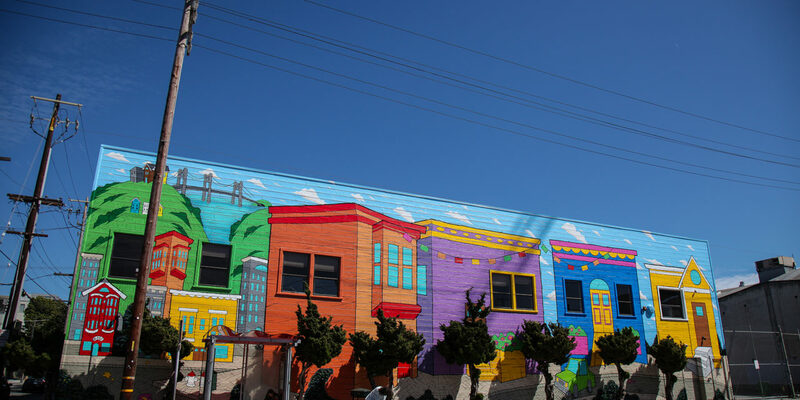 Sirron Norris’ new mural, called “More Housing” replaces his old one on the corners of 18th and Bryant street. Photo by Abraham Rodriguez. It still smells like fresh paint on the corners of 18th and Bryant streets. As it should, since Sirron Norris’ new mural More Housing was just completed this week, under no fanfare. The lack of publicity was intentional: the mural took a toll on him, he said in an email. As we reported last month, the paint on one side of the building was painted incorrectly and was falling off, exposing wood to the elements and causing some structural concern. As a result, his old mural Picturesoteric had to come down. The building owners wanted to commission him for a new piece, but you can find the other half of Picturesoteric along the other side of the building.